The Bharatiya Janata Party unveiled its vision statement for the next five years on Monday. 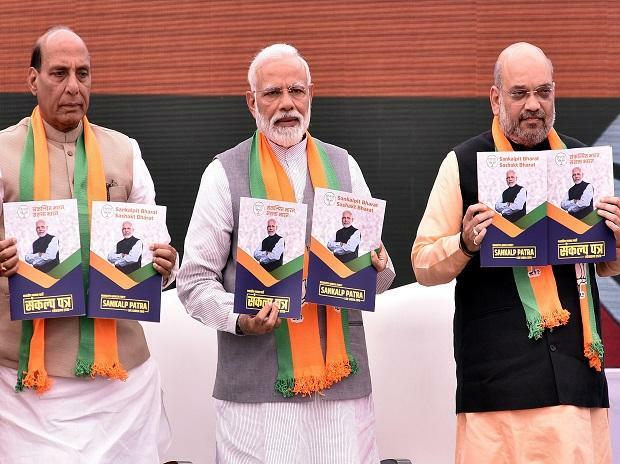 In its manifesto (sankalppatra), the BJP promises a massive investment of Rs 100 trillion in infrastructure and Rs 25 trillion in rural sectors, including agriculture. Though the manifesto emphasised the continuation of lower taxes, the direct tax code found no mention in it. This, despite two panels under the Modi government preparing a draft on the matter. Painting a vision focused on improving the fundamentals of the economy, the manifesto promised to reach out to an “aspirational India” by committing to build 60,000 km of highways, doubling the number of airports, and building metro networks in 50 cities by 2024. The BJP committed to make India a $5-trillion economy by 2025 and a $10 trillion one by 2032. Prime Minister Narendra Modi said the foundation for making India a “developed” country by 2047, when India will mark 100 years of its independence, would be laid during the next five years. If the Congress has promised Rs 72,000 income support to the poorest 20 per cent, the BJP said it had sought to give the poor the tools to help empower themselves. Modi said it was the poor themselves, and not people sitting inside air-conditioned rooms, who could fight poverty. Modi said the vision document rested on three core beliefs of BJP — nationalism, welfare of the poor, and good governance. BJP gave top priority to a “zero tolerance approach to terrorism”, as against providing jobs by the Congress. On jobs, the manifesto promised collateral-free credit of up to Rs 50 lakh for young entrepreneurs, 50,000 new start-ups by 2024, and seed start-up fund of Rs 20,000 crore. It promised to take Mudra scheme beneficiaries from 170 million to 300 million. While the BJP manifesto did not have one big idea, it has reached out farmers by reiterating its promise of doubling farmers’ income by 2022. It said the PM Kisan Nidhi scheme would cover all farmers, not just those with up to 2 hectares of land. This would cost the exchequer another Rs 12,000 crore over the current Rs 75,000 crore a year. The BJP also promised zero-interest loans of up to Rs 1 lakh to farmers for five years. This would double expenditure to Rs 36,000 crore, as against the current Rs 18,000 crore due to interest subvention. It made enrolment under the PM crop insurance scheme voluntary — an indication that the scheme is not popular on the ground. It also promised pension for small and marginal farmers. However, there are no specific schemes for the landless apart from promises of providing pension and Rs 13 a kg subsidised sugar to 800 million people. The Modi government’s interim Budget had introduced a pension scheme for the unorganised sector. The manifesto also reached out to the medium and small enterprises (MSME) sector, retailers and small shopkeepers who had faced the brunt of demonetisation and goods and services tax. BJP promised Rs 1 trillion for the MSME sector by 2024 and a pension scheme for small merchants. Finance Minister Arun Jaitley said the previous governments had only given slogans but the tenure of the Modi government has witnessed the “fastest depletion of poverty” in independent India’s history. He said Modi’s was the only government to have delivered resources to the poor, controlled inflation, gave India a five-year period where taxes were reduced that put more money into the pockets of the people, and expanded tax base and collections. The FM said the objective of the manifesto was to deplete poverty to single digits in the next five years. He said 8 per cent-plus growth would ensure this. “Those who have performed their words carry high credibility than those who failed in the past,” Jaitley said. The manifesto said BJP’s “economic model is based on entrepreneurship and innovation” and committed to “simplifying and lowering tax rates”. It promised to “significantly increase the capacity of the legal system” to improve ease of doing business and ability to enforce contracts and resolve disputes. The PM said his government would ensure each home gets piped water by 2024. The manifesto has promised a separate ministry for efficient management of water. Other key promises include amending the Companies Act to unclog cases from courts, a new industrial policy, a National Traders Welfare Board, a national policy for retail trade for growth of retail businesses and a merchant credit card on the lines of kisan credit. On its core issues of cultural nationalism, the BJP has promised annulling Section 35A of the constitution that deals with Jammu & Kashmir, zero-tolerance approach to terrorism, implement National Register of Citizens in a phased manner across the country and implement the Citizenship Amendment Bill. In a more nuanced position on the Ram temple issue, the BJP said it will “explore all possibilities within the framework of the Constitution and all necessary efforts to facilitate the expeditious construction of the Ram Temple in Ayodhya”.